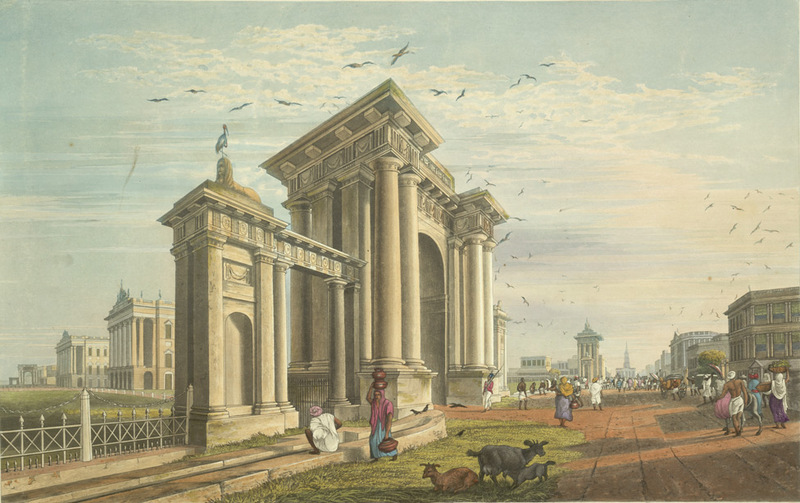 This is plate fourteen from James Baillie Fraser's 'Views of Calcutta and its Environs'. Fraser (1783-1856) arrived in Calcutta in 1814 and in six years produced these animated sketches of the busy city, published later as a collection of 24 superbly aquatinted plates. In the collection he devotes three plates to the Government House, all of them taken along its eastern side. The accompanying text reads: "The view up Old Court House Street, closed by St. Andrew's at the further end, although not totally successful, as the perspective distorts the right-angle relationship between the south front of Government House and Old Court House Street, renders this same south-estern gateway a veritable Roman triumphal archway."